Some of the world’s most viewed TED talks were from TEDx events in local venues. Following Arthur’s recent talk, students asked how he prepared. In short, he prepared as if it was for a recital, not for a presentation. If you want to become a world famous author, in demand speaker, global thought leader, or share your most profound insights with the world, there’s no better or faster way than to put on an amazing TEDx talk. 1. Think of a presentation as a performance. As an artist takes a moment before walking out to center themselves, we must do the same. This is what Arthur calls, a “Mastery Moment” Whether it’s a keynote or a powerpoint. Always be sure to put yourself in Stature. When you first walk out to the stage, take 5 seconds to focus, employ a Conscious Loving Breath, and begin. One of Arthur’s axioms is, “the single most important way to control the flow of information, is to control the flow of breath.” Employ breath strategically. 2. Eye contact with your audience is critical. Make key points to one person or to one section of the audience and complete it before moving on. Don’t change eye contact within the same thought. 3. Use Visceral Language. It is critically important to embedding both the message and the stature of you, the messenger. Whenever possible, memorize your presentation so you have no notes. This of course requires practice. 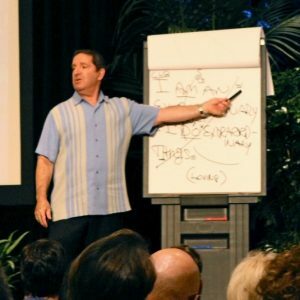 In business, most speakers do not rehearse extensively if at all. Imagine if you went to a show to see your favorite performers and they did not practice or rehearse… how would that would diminish your experience? They would not be as good as they could be had they simply practiced. If world famous actors and singers have to practice, then so do you! Even the very best rehearse. That’s why they are the very best. 4. Whenever possible wear a lavalier mic, as you are then not constrained at a podium. If you only have a podium mic, make sure that as you start speaking that it is tilted towards you and should be angled just below your bottom lip. If you are holding a mic, it should always be held at your sternum. Don’t hold it too high and block your face. It should not be vertical, it should be slightly tilted toward your mouth. Holding a mic takes a bit of skill. Practice with your own mic at home or with a hairbrush. As with all Vocal Awareness exercises, practice on a mirror. It helps to objectify the experience. Begin with your hand at your side. You want to feel that the mic is an extension of your hand. There should be no tension. Hold it gently, and just bring it up as naturally as can be. It takes practice to move your head and remember to move the mic as well. The mic must always move with your head. 5. Your feet should be shoulder width apart and with one foot slightly in front of the other. 6. See the Edge and Arc. We’ve all heard the adage, speak to the last row of the house. Do not do this, as you will raise pitch. Instead, see the edge and arc of sound, and find the hub of the voice before walking out on stage to help you find your pitch for the optimal range for that meeting and in that environment. 7. Always remember before walking out, make sure you are in Stature. In Vocal Awareness this is not merely standing up straight. (see training around this in the VIP Club – use coupon code “TED” for a 50% instant discount). Remember to remain in Stature, use your core support, open your chest, and claim your great physical presence and sound. Importantly, once you are in Stature, do not let yourself become rigid. Stature is not static. The image of pulling the thread is a continuous lifting and pulling. You will notice that it engages your core and opens your chest, which gives you more physical and dynamic presence and provides maximal support for you and your voice. 8. If you move, move with purpose. If you don’t need to walk, grow roots. Don’t move randomly, you don’t want to diminish your energy. If the stage is large, you will need to move a bit to engage the full audience. Whenever possible, find your mark and move no further than a foot or so one direction or another. The body speaks – so be in charge. Once again in Vocal Awareness it is not merely what we say, it is how we say it. Your favorite performers may look totally relaxed and natural, but that’s because they have spent thousands of hours preparing for it to do so. Even the extraordinary actor/comedian, the late Robin Williams, who was a master of improvisation, practiced thousands of hours so that his improv was “spontaneous”. Remember the root of the word presentation is “to introduce formally, to bring before the pubic”. Perform means “to fulfill, to do”. Fulfill your possibility and carry it out to the best of your ability. To do and be your very best. P.S. The TED celebration continues! 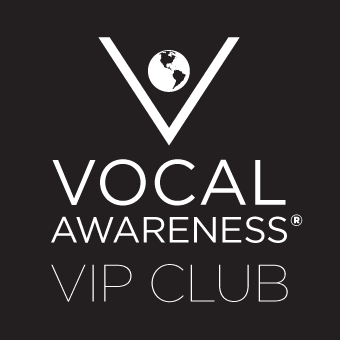 You can still use the coupon code TED this week for50% off your favorite Vocal Awareness course.